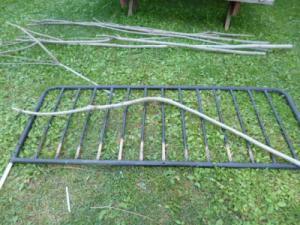 Finally, my own rustic twig gate. 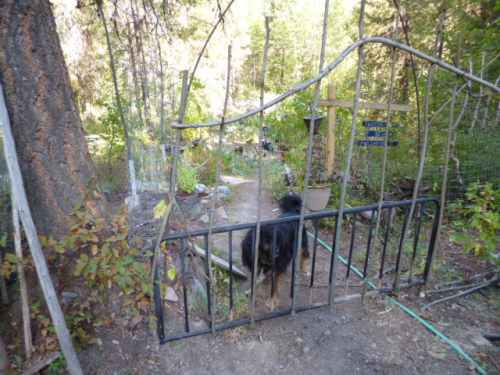 After fussing and fiddling with a piece of fish net to keep the deer out of my garden, I finally broke down, and built the gate I’ve been dreaming of. Luckily, I keep all kinds of salvaged junk; you never know just when you’re going to need something. Old futon sofa beds are so ugly and uncomfortable that people are always offering them to me. I’ve got two of them now, and after taking them apart I’ve found the best parts to use are the flat panels, which are tubular metal in a rectangle and then smaller hollow tubes in a ladder looking thing. As soon as I saw them I saw the potential for a gate, it’s just taken me a while to get it right in my mind. The metal piece (that the mattress sits on) is about 60cm (2 feet) by 150cm (4’6”). 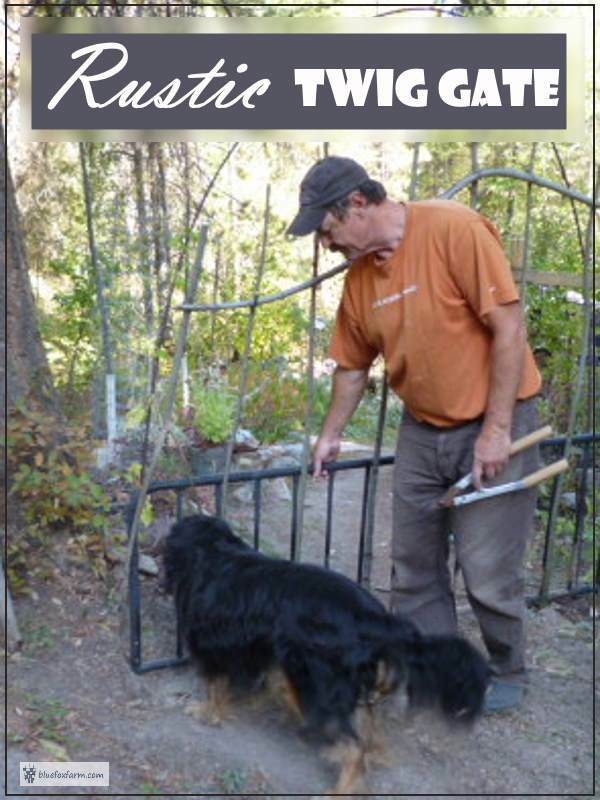 This is wide enough to fit across my rebar archway, and I could imagine attaching twigs to it to make it taller and fit the rest of the arch way. I spent a half an hour collecting willow twigs, cutting them and dragging them down to my work area (the lawn). After trimming the branches off, I was left with about 15 variously sized long twigs, with one very unique bent one. I peeled one of the straightest ones, and cut it to fit inside the tubular steel of the frame, with an extra 30cm (1’) that would be inserted into a piece of bigger tube steel (salvaged from a portable garage that was thrown around by a windstorm) that would be pounded into the ground. This makes a pivot for the gate to swing on. I have a special tool to accomplish that part, which is a piece of 2x4 lumber with a short piece of twig attached at a 45 degree angle. The piece of twig goes into the metal tube to be pounded into the ground to hold it, and the 2x4 lumber protects the top of the tube from the sledgehammer. Twigs are wired on in no particular order, and a wiggly one keeps them all in place. It worked perfectly; my rustic twig gate swings with one hand, no more fussing with fish net and getting tangled up in it, and Bracken likes it too.